Beautiful foxes, I love the colors. I think I already commented on this one, but just adore those little fox! I now know how to color one! Thanks for doing the demo AND talking me through it. Thanks again for another cute set of tags. I have to try adding a scarf to my fox stamp. Man oh man Sandy, for me, the best thing about your Copic coloring (and there are a many)is how you achieve texture in your images! Taking that YG03 to add highlight over the dark trees was ‘the bomb’ LOL! Then of course you take it further by adding texture to his adorable sweater. Another amazing teaching tutorial Sandy and that is what I love most about your YT/blog! Thank you so much! I learn so much from you – thank you! Love the trees and how you color and shade the Fox. That fox looks so warm and fuzzy that I just wanna give him a big squeeze! Awesome and amazing tags! Ohhhhhhh he’s gorgeous on tags & card. I’ve learnt so much off you on this video today, starting to try darker colours myself now, but still hold my breath to the end hehe.Thank you so much . These are adorable! Your coloring looks fantastic and the trees are wonderful! Those trees! Thanks for sharing! Such cute tags! I like how you have the fox leaning into the scene and how you made the trees in the dark background. I learn a little every video of yours I watch! 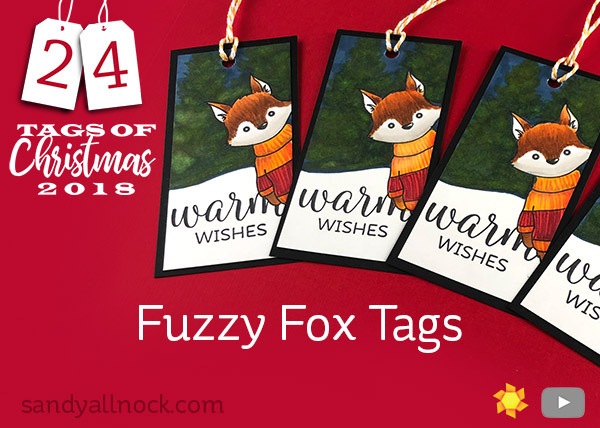 I absolutely love these tags Sandy….what a cute fox and love the sentiment font. I could sit and watch you color all day. You are awesomely talented. Cute little fox tags, I’m going to try out your background trees! Cute as can be! 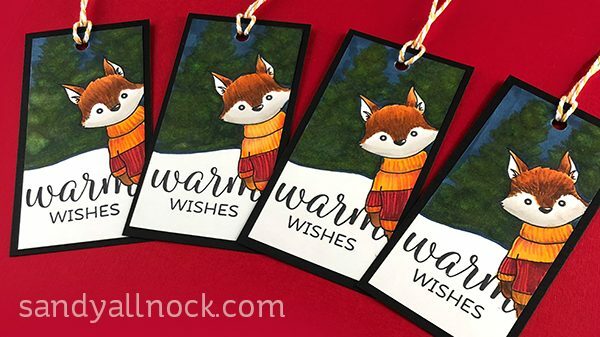 Love these adorable fox tags! Thank you for sharing how to make the trees in the background! I love the ribbed sweater! That Fox is just so darn cute. I love the trees I’ll have to try that, and remember the snow trick, lol. I think this one of all the days is my favorite! Thanks for sharing the technique of the dark background and the trees. I love the snowman tags and the doggies and the pinecones too! I like them all but those are my favs. The snowman card and the doggie that wouldn’t fit on the tag card are tooooooooo adorable for words!!! I really enjoyed watching everyone! Thank you for getting my spirits in the mood to celebrate Jesus’ birthday!! is so cute. Love the tag. The fox peeking in is cute. So cute! Love how you made those trees in the dark. Amazing! This little cutie makes me smile! Lovely. So cute. Had one in the back yard the other day. I really enjoy your verbal instruction also. Wow Sandy! These tags are adorable 🙂 Thank for the wonderful coloring techniques and tips too! I like that you share why you did the background before you finished the fox. Also the reasoning behind his fur. Thanks so much, Sandy! I have been watching your videos for some time and am ALWAYS impressed. These are super cute! Love the texture you gave to the fur. Love the tree technique! The fox is so cute! The fox is just precious!! I love how he is peeking, and how you made him look fuzzy! And those trees are so pretty! This little fox is just too cute! What CUTE little foxes! Awesome coloring! I love seeing cute foxes in the fall and winter! These tags are so cute I could squeal! Perfect! Your fox is amazing. You make it look so easy. Thanks for the info about the trees. I’ll have to remember that. The fox tags are so cute! I love the trees in the background, you just amaze me on how you just use a copic markers and you have trees. I LOVE how you have the fox peeking slightly sideways into the edge of the tag. So adorable! 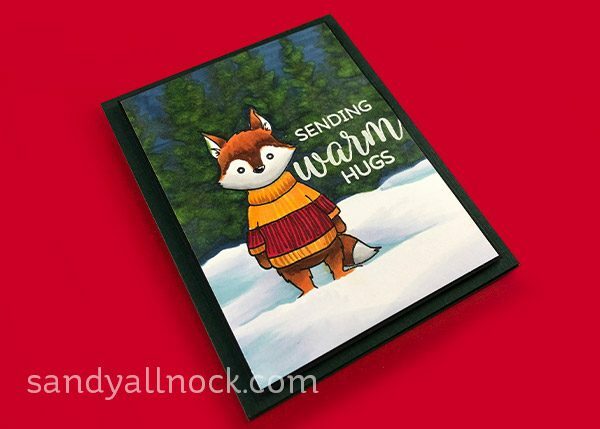 Love the full length fox on the card too. Thanks for an opportunity to win! Love your coloring of the fox. I now need time to try this technique myself. I always love watching your videos! The fox is soooo cute! Thanks for showing the background and sweater techniques. Oh how cute I love the little fox image and your tree technique! I will have to try that out. I’m really enjoying these series and seeing how you can create 4 tags at once! I find your tips and tricks so helpful. Cute coloring and lovely tags. What a fab fuzzy fox! Hi Sandy! Thank you for sharing the technique for making the trees in the dark…looks really awesome!! The snow drifts on the card are really cool!! And I can’t leave out the cute little fox…pretty adorable!! Great tags. And the card is a real bonus. I really like your tips on using Copics. Love the fox tags and card. Sandy you make coloring with Copic Markers look so easy. Thanks for sharing. Yes, I agree the little fox does look more playful when placed on the side of the tag. Nicely done! So cute! Really interesting coloring on this one. Definitely out of the box! Really appreciate the inspiration! My mother is a HUGE fan of foxes and is always trying to find ways to incorporate them in her decor. This is such a fun idea–I think she’ll end up enjoying the tag more than the actual present.